Tension between the two camps threaten to plunge the country into a full-blown civil war . The military conflict troubling Libya escalated on Sunday as forces of strongman Khalifa Haftar launched an air strike on a suburb of Tripoli and the UN-backed government vowed a major counteroffensive. The UN called for an urgent two hour truce for the southern outskirts of the capital to allow evacuations of civilians and the wounded. Tension between the two camps threaten to plunge the country into a full-blown civil war after Haftar on Thursday launched an offensive on Tripoli. Oil-rich Libya has been riven by chaos since the NATO-backed uprising in 2011 that killed dictator Moamer Kadhafi, with rival administrations and armed groups vying for power. As clashes raged in the mainly farmland region of Wadi Raba and the disused international airport south of the capital, a spokesman for pro-GNA forces said a "counteroffensive" had been launched to push back Haftar's forces. Colonel Mohamed Gnounou told reporters that operation "Volcano of Anger" was aimed at "purging all Libyan cities of aggressor and illegitimate forces", in reference to Haftar fighters. The LNA meanwhile announced it had carried out its first air raid on a Tripoli suburb, despite calls by the international community to halt hostilities. GNA head Fayez al-Sarraj warned on Saturday of a "war without a winner" and said that reinforcements were pouring into Tripoli from several regions. Powerful armed groups from the western city of Misrata and fighters from Zentan and Zawiya -- all battle-hardened militiamen who took part in the 2011 uprising that toppled Kadhafi -- have joined the battle. Misrata fighters ousted the Islamic State group from Libya's coastal city of Sirte, Kadhafi's hometown, in 2016 after months of bitter fighting. 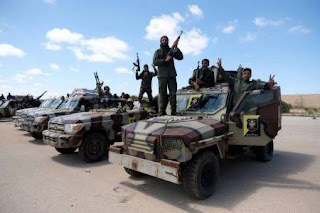 Sunday's LNA air raid came a day after forces backing the GNA launched air strikes on their rivals for the first time since the offensive began, with at least one targeting an LNA position south of Tripoli. Analysts say Haftar has been buoyed by a series of successful military operations that have brought all of the east and much of the south of Libya under his control. A field marshal who served under Kadhafi and now backs an administration in eastern Libya opposed to the GNA, Haftar was counting on a swift battle to capture Tripoli but some experts say he miscalculated. To date, Haftar's operation has mostly failed to go according to plan, and it has now galvanised western Libyan forces against him," said analyst Wolfram Lacher. "He now faces the prospect of a protracted war south of Tripoli, or of a decisive defeat," said Lacher, a researcher with the German Institute for International and Security Affairs (SWP). As the tension mounted, Tripoli residents were seen Saturday queueing outside petrol stations and supermarkets. The UN Security Council has called on Haftar's forces to halt their advance, warning it was putting Libya's shaky stability at further risk. But UN envoy Ghassan Salame insisted on Saturday the April 14-16 conference would go ahead. "We are determined" to hold the talks, he said. Sarraj said the conference was meant to pave the way for a "stable" government and accused Haftar of "betraying" an agreement reached during a meeting in February to push for elections and a new unity government before year's end. On Saturday Haftar chaired a meeting with the parallel Libyan administration based in the east of the country to discuss a "security plan" for Tripoli that would be implemented at the end of the assault, his media office said.